LA Green Grounds “Dig-in” in South Los Angeles. Photo courtesy of LA Green Grounds. In Los Angeles, CA, community members involved in the urban farming and food justice movements are keenly aware of the food insecurity that is so prevalent in its South Los Angeles neighborhoods. It was this insufficient access to healthy, nutritious food that spurred Florence Nishida to co-found LA Green Grounds, a volunteer organization that works with residents of South L.A. to convert their front lawns and parkways into edible landscapes and urban farms. Making vegetables a visible part of the community is what has guided LA Green Grounds ever since its founding in 2010. The organization grew out of Nishida’s work with the UC Master Gardener program. In 2008, Nishida developed and taught a series of classes as part of the Master Gardener’s Grow LA Victory Garden Initiative, which seeks to arm community members with the skills to start their own gardens in containers, on a community plot, or in a backyard. The classes were offered on land provided the Natural History Museum of Los Angeles, which is located in South L.A. The experience of working in the South L.A. Community and perceiving the rampant food insecurity and lack of access to supermarkets in the area, prompted Nishida to team up with Vanessa Voblis, her teaching assistant in the gardening programming, and Ron Finley, who had taken the Victory Gardener classes and was also committed to food justice. Together, they launched LA Green Grounds. The nonprofit embraces a grassroots style of organization to achieve its mission of working with residents of South L.A. to transform their parkways and front lawns into urban farms and edible gardens. While LA Green Grounds guides garden installation for pre-selected and screened residents, it is the garden recipients that is charged with finding the labor in the community to make their urban garden a reality. To that end, residents that are selected by LA Green Grounds for garden installation, host a “Dig-in,” wherein they recruit friends, neighbors, volunteers, family to help them turn the earth and plant the garden. Nishida says that these “Digs-ins” create a sense of community, as diverse stakeholders come together to help a fellow resident and learn how to convert a lawn into an edible garden that hopefully will serve to encourage and inspire others in the neighborhood to plant their own gardens. 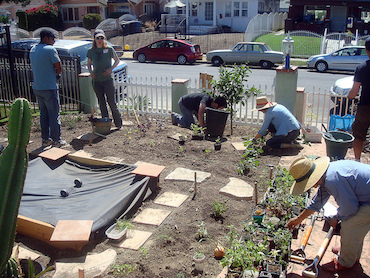 Since 2010, the LA Green Grounds has helped to install 35 residential gardens in South L.A. While LA Green Grounds has achieved a great deal of success in helping to empower residents of South L.A. to create urban farms in their front yards and alleviate food insecurity, the organization still faces many challenges including the fact that the organization has no paid staff. “We are all volunteers, nobody gets compensated for anything, and it’s really hard to maintain a good sized corps,” says Nishida. Another challenge is the sustainability and ongoing maintenance of the gardens themselves. “We’ve been looking at how we can select people who will take care of gardens,” she says. “It turns out that the strongest gardeners are people who really have a keen interest in and really enjoy food. It’s good if they really like to cook.” The organization has added food preservation and cooking classes.